Bookride: Deep Sea Diving. Robert Henry Davis, 1935. DEEP DIVING AND SUBMARINE OPERATIONS: A MANUAL FOR DEEP SEA DIVERS AND COMPRESSED AIR WORKERS. Much wanted and well regarded diving book. 'The bible for hard hat divers.' 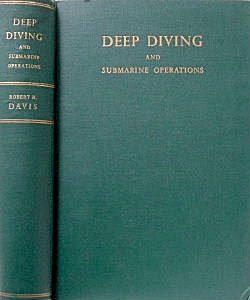 Diving is a well known area of collecting and like Golf and Mountaineering those who go in for it often start collecting the books. Handsome well illustrated tomes, much recondite info - including some fictional stories and dry wit and many 'diver's yarns.' As an exposition of the art of deep-sea diving it is second to none. Sir Robert Henry Davis(1870–1965) gets a good entry at DNB - as they put it '...Davis devoted his life to the study of problems confronting those called on to work in unbreathable atmospheres.' The DNB, by the way, notes an edition of this book from 1920, which I must investigate; he is known to have revised it throughout his life.